Our Atelier range (for Atelier Organs, KR Pianos, E300, E500 and E600 Keyboards) is written with the home organist in mind. We have found that most organists don't want too much going on in the background. Consequently our Atelier range listed below is written with this in mind and they don't get in the way of your playing. Written with our usual high quality they will broaden your instruments musical library and give more variation your repertoire. All are general styles i.e. if you wish to play a song done in a samba style you should be able to play more or less any samba with the rhythm. Please note though that we have tested our G70 style software range on Atelier 800 and 900C and are very pleased with the results. 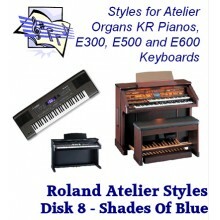 So for those that would like more comprehensive patterns please also see this range of disks. Twelve classic foot tapping country styles with audience pleasers from country waltz to country..
Twelve essential ballroom styles designed to enhance your playing for ballroom and sequence dan..
Twelve classy styles covering a number of popular genres and featuring the instruments brush kit. ..
Get your party started with these new party beat styles. Twelve patterns that will widen your Pop an..
From a hint of Irish to a flat out Irish jig. Sixteen styles to bring the genre to life! File ..
Twelve sparkling latin styles with Samba, Jive & Tango to a more gentle easy Beguine. ..
Twelve Big Band styles that will bring the musicians of the band right into the room with you! ..
Another twelve sparkling latin styles with dancing Cha Cha's to party numbers such as Lim..